I want to write more about The Economist cover for 2015, which I have previously discussed. Please click here and look at it for reference. The Economist is among the English-speaking world's most influential current affairs and policy journals. It must be noted that the globally influential, Rothschild banking family is among its ownership group. Therefore, when The Economist prints a cover as highly symbolic as it did just a few weeks ago, it is reasonable to assume that the globally influential banking powers, including the Rothschilds, intend to send a coded message to their elite readership and to the informed part of the world that is "in the know." So what happened just after The Economist published this esoteric magazine cover? Why, the so-called Islamist terror attacks in France, that's what. There was a horrific mass murder at the Charlie Hebdo offices in Paris, and another killing at a Jewish market in eastern Paris. Many commentators, including me, view these attacks as a classic false flag operation, in which the alleged assailants were very likely disposable, throw-away patsies, that were first viciously used and then violently discarded by their shadowy intelligence agency handlers. I say that because all of the alleged perpetrators were shot dead by the police within mere days. Since dead men tell no tales, the "official" police account of what happened rules the day. But I think we can safely assume there was some sort of Rothschild involvement. After the attack at Charlie Hebdo's offices, there were reports in the European press that the next issue was printed at the offices of Libération, a Parisian newspaper which had been purchased just one month prior by -- wait for it -- a member of the Rothschild family, Édouard baron de Rothschild. Moreover, a newspaper that was previously printing 30,000 copies, in just one week, after its editorial staff was shot dead, somehow managed to put out a new issue, with a print run of 7 million copies! That only happens if there are very powerful hands working behind the scenes, making things happen on a huge scale. In a word, the fix is in. Things were prepared in advance by those who knew what was going to occur. None of this surprises me, because, you see, the satanic, Rothschild, global banking faction had already telegraphed their maneuver in advance, with the symbolism on The Economist's cover. Look at French President, François Hollande, who is standing in the second row of world leaders. Just to his left is a woman with a strange, winged headdress, looking fixedly at him. Bingo! That is the Rothschilds' calling card, their weird way of telling Hollande that they have plans for France and that he had better watch out. Let me explain. Please click this link and look at the headdresses and masks from a Rothschild family sponsored soirée, or Illuminati party, as it were, that was held in 1972 at the Château de Ferrières just outside of Paris. I don't even want to know what some of the photos mean. If you have seen the 1999 film, Eyes Wide Shut, by Stanley Kubrick, then you will understand that his film was very likely alluding to the sort of 1972 "party" at the Rothschilds' French mansion that you can see in the link above. The woman with the winged headdress who is staring at President Hollande could have stepped right out of the 1972 Rothschild "party." The occult, hidden, shadowy, stealthy movers and shakers and backstabbers and cut-throat billionaires and so-called "ruling elites" that are dragging the world down to ruin are the very people who frequent these Illuminati "parties." It is with this subtext that French President Hollande remarked a few days afterward that the so-called "terror" attacks in Paris were carried out by the "Illuminés" (French for the Illuminati). His security forces undoubtedly quickly pieced together an evidence trail that is similar to what I have laid out for you here and presented the case to him. President Hollande knows exactly what he is up against: an internationally entrenched, massively well funded, diabolical, Hydra-headed monster that will commit any atrocity, that will murder any one person, or even wage wars that kill millions of people, in order to maintain its stranglehold on power and force humanity deeper under its violent subjugation and control. For my money you can probably look for agencies such as the CIA, Mossad, the French "Piscine" and maybe MI-6 to be the first, violent level behind the ugly events in Paris. But they are ultimately just the pawns of the Rothschilds and allied factions. The higher-ups in those espionage organizations receive their own instructions from shadowy players who pull their strings. Kill or be killed, that is how that world operates. It is vicious. And I mean anything. Look again at The Economist cover. Look at the nuclear mushroom cloud billowing out of the top of the head of David Cameron, the current British Prime Minister. Just beside him is Winston Churchill, the WW-II-era British Prime Minister, giving his famous "V for Victory" salute; however his glove is torn open and it looks like only the middle finger is raised -- resulting in a not-so-veiled "middle finger salute," of the "f*** you" variety. Churchill also has something roaring out of the top of his head -- a rocket that looks like it is carrying a spy satellite payload, or perhaps a clandestine nuclear warhead, disguised as a "spy" satellite? Does Churchill represent the Old Guard in the British power establishment, say MI-6 and MI-5, or maybe Buckingham Palace, and Cameron the New Guard? Does this mean there has been a meeting of the minds and of the political generations in the British power establishment and they plan to unleash nuclear hell, maybe one or more nuclear false flags? The nuclear mushroom cloud and "spy" satellite rocket are both roaring up out of the tops of two British Prime Ministers' heads. Is that code for: the coming events have been authorized at the highest level of the British political establishment? Number 10 Downing Street? Buckingham Palace? The Secret Intelligence Service, MI-6, also referred to as SIS? You know, Rule, Britannia!, God save the Queen!- and all that City of London, No. 10 Downing Street, Scotland Yard, House of Windsor, Eton and Oxford, "I say old chap" horse sh*t.
And now that I have mentioned it, how can you and I help but notice that on the game board on the lower left hand side of the Economist cover are the words, PANIC at the very top, and Federal Reserve, as well as the beginning of a word that starts with "Chi..", which presumably refers to China, since it is partially obscured by the right arm of the muscular panda bear that is clearly a representation of growing Chinese power and influence. But what if the word is really "Chicago" and not China? We don't know. We cannot see. And at the bottom of the game board are the words, Green Light! and ...SIS. Has the SIS (MI-6) been given the Green Light! to carry out a major operation? Has the Green Light! come from the very top of the British political establishment? Does it have something to do with a Federal Reserve PANIC? Might Chicago be involved? Might a nuclear mushroom cloud be involved? We'll find out. There are lots of clues, lots of data points. Connecting them up is another matter. Actually, here I am referring to the point of the two arrows that are impaled in the ground at Alice's feet, at the lower right of The Economist cover. Talk about telegraphing your message. One arrow is boldly painted with 11.5 and the other with 11.3. That's easy enough. In European format, these are the dates March 11 and May 11. "3/11 has some of the most violent astro I have ever seen. PLUS has a signature of something like a nuke accident. 5/11 has something similar but not quite as violent. I see things as scripted and is intended to give the fundies the Armageddon they so desire." Being as the arrows are deeply impaled directly at Alice's feet (Alice being the Alice of Alice's Adventures in Wonderland fame) this can plausibly be interpreted to mean that the Rothschilds and the rest of the Illuminati/ZioNazi-Anglosphere/Central Bankster/Fortune 500/Wall Street/ City of London/EU/NATO/Mossad-CIA-MI-6-"Piscine"-BND Alphabet Soup Agency Fascists have firm plans to take us all straight down the rabbit hole. I am surprised The Economist didn't put Alice's white rabbit there someplace, though they do have the Cheshire cat grinning at us, perched on a tree branch that is growing out from behind Barack Obama's leg. Isn't that encouraging? You have to wonder what the Puppet-in-Chief of the USSA has up his sleeve, or perhaps down his pants leg. The next thing you notice is that there is a man wearing virtual reality goggles standing just behind Barack Obama. He is looking at Barack Obama. The goggles he is wearing are Oculus virtual reality goggles. Development Kit 2. The meaning of this is obvious. Everything that you see coming will be a MIRAGE. It will be a second, FAKE reality. Let's call it "virtual" Reality Number 2. It is under development now. Virtual reality is not real. It is FAKE, artificial, MADE UP. So, when you see the "coming attractions" transpire on the global stage, remember that what you are seeing is all staged, it's made to happen, the events are rigged. People may die, maybe even in extremely large numbers, but the official story that we will be given for it will be FAKE. The reasons for it all will be false, contrived, deceptive, not true. A macabre, grim, hyper-violent, virtual reality has been superimposed on "real" reality. Real reality has been hijacked and we are in for a bumpy ride. Barack Obama -- The Mother of All Virtual Reality Mind-F*ck(er)s. What you see is not what he really is. And the Master of Ceremonies Is ..
Conspicuously front and center is a green tortoise crawling on the floor, looking right at us. Isn't that special? An autographed painting. The malevolent entities behind this work of art signed their name! An influential British establishment think tank, the Fabian Society, has as its symbol, a tortoise, that very closely resembles the tortoise on The Economist cover. 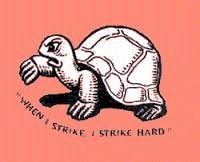 Notice the Fabian Society's motto: "WHEN I STRIKE, I STRIKE HARD." That's clear enough. Among the Fabian Society's goals are a "commitment to British imperialism as a progressive and modernizing force." Think: SIS (MI-6). ISIS. Men in black ski masks chopping off heads. There's your British imperial civilizing influence. Think: nuclear mushroom cloud billowing out of the top of the head of David Cameron, the British Prime Minister. So when you see the things happen that are now in the pipeline, when you see them STRIKE HARD, understand that you are seeing the reality of the Illuminati/ZioNazi-Anglosphere/Rothschild/Windsor/Central Bankster/Fortune 500/Wall Street/City of London/EU/NATO/Mossad-CIA-MI-6-"Piscine"-BND Alphabet Soup Agency Fascists. You are seeing the cringe inducing reality of the Windsors, of MI-6, of Whitehall, of Eton. And it's all "veddy prawpah" sh*t from the pits of hell. I have a lot of readers in Britain. Dig it and grok it. Probably you already have. I hope so. How can you possibly justify your part in this dark insanity that is taking the whole planet down, and the human race with it? How can you be so blind? I really do need and accept your donations for support of my writing. I have no bank account(s), no bank card, no pension or trust fund, no stocks and bonds, no ETFs, no puts, no real estate, silver or gold, no inheritance, etc. You could accurately say my financial circumstances are very reduced. I put a lot of thought, time and effort into my research and blog posts, which are read by many thousands, all over the world. So if you find value in my ideas, writings and adventures please support my continued work. Contact me at: dr.samizdat1618@gmail.com for how to donate.